Ella Rhodes reports on therapy dogs. In the first research of its kind psychologists are taking a therapy dog into a UK court to assess whether they can be helpful to defendants and witnesses. Investigative psychologist Dr Liz Spruin and her trained therapy dog Poppy are carrying out a pilot study in a Kent magistrates’ court. Spruin and her research team – Katarina Mozova, Susanna Mitchell, Nicole Holt, Dr Anke Franz and Dr Ana Fernandez – were interested in the use of therapy dogs in US courts. They contacted the country’s Courthouse Dogs Foundation and realised there was no research on the effectiveness of dogs in this context. 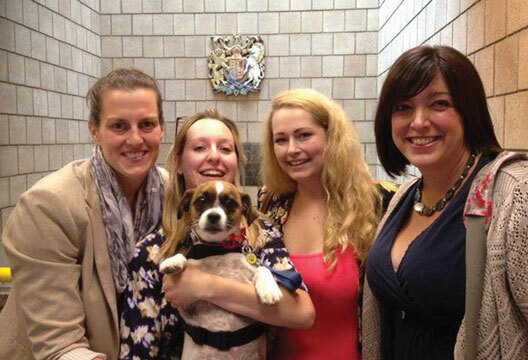 Each Friday, Spruin, Poppy and her team have been walking around the defendants’ and witnesses’ waiting rooms and carrying out short interviews with those who engage with Poppy – a Jack Russell/Shih Tzu cross – about what the experience was like. Spruin said Poppy hasn’t only been engaging with witnesses and defendants: ‘Sometimes we have translators engaging with Poppy, lawyers, and volunteers for victim services,’ she said. In the next stage of the project Spruin will be following two case studies to assess whether Poppy can be useful to vulnerable witnesses from the moment victims’ services engage with them up until the time they come to give evidence in court. Eventually, Spruin said, she hopes to purchase a specially trained dog from the Courthouse Dogs Foundation who may become the UKs first court-based therapy dog. The team at Canterbury are happy to speak with anyone interested in collaborating on this project. E-mail Liz Spruin on [email protected].